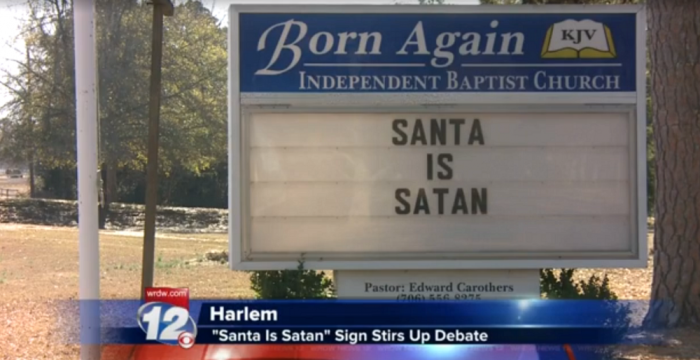 A church in Georgia has posted a message on its marquee sign that reads "Santa is Satan," which has stirred local and national controversy. Born Again Independent Baptist Church posted the message at the beginning of the month in response to the cultural fascination toward Santa Clause. Edward Carothers, pastor at Born Again Baptist, told The Christian Post that the decision to post the message on the church sign came by decision of the congregation. "Our church decided to post this message after being burdened by a false deity taking over the Christmas season," said Carothers. "We as born again believers traditionally set aside December 25th to celebrate the birth of our Lord and Savior Jesus Christ. For several years now I noticed less and less nativity scenes and more Santa." Carothers also told CP that he believed that the American cultural fascination with Santa Clause was tantamount to idolatry. "It would seem from the counties and cities claiming separation of church and state have no problem at all with Santa, but have a huge problem with Jesus – the reason for the season," continued Carothers. Carothers cited a 1996 work by James L. Melton titled "Santa Claus and Satan's Cause", which argued that, by having several similar characteristics to Jesus Christ, Santa was being crafted by secular culture as a false god to worship. "Friend, don't glorify Satan by giving the glory and attributes of Jesus Christ to Santa Claus! Santa is a COUNTERFEIT GOD," wrote Melton. "… you are honoring Satan when you teach your children to believe in Santa! Christians should teach their children the TRUTH. We should glorify God by teaching our children about Jesus Christ and His saving grace!" According to local media, many residents of Harlem have their doubts about the laconic message by Born Again Baptist. "For something like that to be on that sign it's absolutely ridiculous," said Harlem resident Drew Pate to WRDW News Channel 12. "We have a one week old and I don't want when he gets bigger, 'Daddy is Santa really Satan?' and have to explain no it's just somebody's crazy idea." Carrel Davis, youth director by the nearby Harlem United Methodist Church, told Margaret-Ann Carter of WJBF that the sign was creating "wedge." "I don't know the church in itself, but just as far as a church putting that on the sign I think that tends to create a bigger wedge between the church and the community," said Davis. "You're not going to find scripture in the Bible saying that it's a sin to believe. I don't think it does harm to kids. Tell kids about what Santa does, he is a giver." In his comments to CP, Pastor Carothers said that the overall feedback his church had gotten over the message was "40 percent positive." "I think Christians should stand for the faith! That we must defend the message of the birth of the Christ! Christ is God's gift to mankind," said Carothers. "Christians year by year are driven back by the world, the flesh, and the devil ... The church of the living God was empowered! Now seems to be retreating to the closet. While sin is running rampant, the church sits quietly by and hopes to go unnoticed."